We went to Playa Grande, our favorite beach, - the first time we've spent the day at the ocean since we arrived. We're still consumed with finding a new place to live. For lunch, we stopped at Bula Bula's and met the 2 guys from Santa Cruz who opened the business 10 years ago. 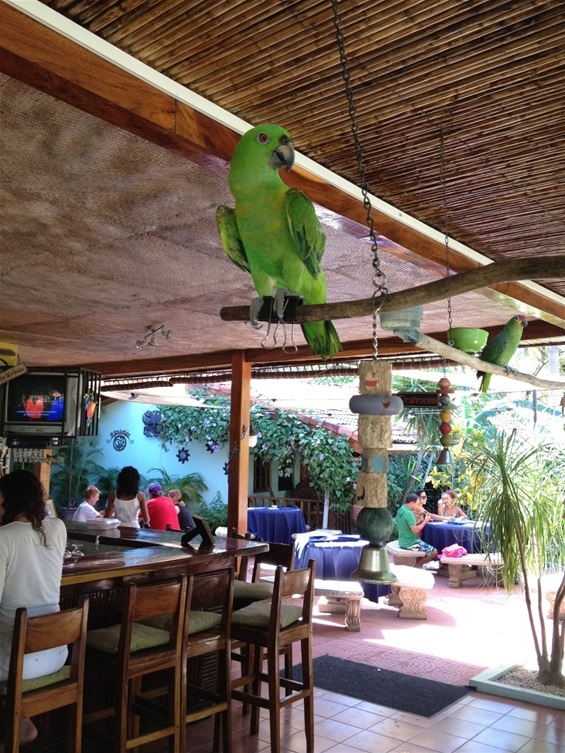 We started talking and found out they manage 34 properties on Playa Grande. I jumped in the 4x4 with Wally and we looked at some houses. Most the available dates did not match ours, but we might have some possible leads. Meanwhile Lauren jumped in their pool. That's right, it seems that a lot of lunch and dinner places have a pool on site and you can jump in. I had an 8 oz burger made from ground New York strip which tasted much different because it is not corm fed beef. The parrot was 11 months old and fell off his perch when we were eating. He just got a little too excited.